When designing an outdoor kitchen or eating areas, it is important to ensure that the area to be used is appropriately designed for a whole range of things- providing cover from the weather, having easy access into and out of the house, having a level flooring and circulation space to avoid slips trips and falls and making sure there is sufficient natural air flow where gas appliances are being used. Gas Barbecues need adequate ventilation to ensure that there is sufficient air for combustion and to dilute the products of combustion to safe level. Where barbecues are used in an outdoor area, there is usually adequate natural ventilation. However there may be some semi-outdoor situation where there is inadequate ventilation and the use of barbecues is these areas is therefore not recommended. Outdoor gas barbecues and other appliance are generally not designed or certified for use in enclosed areas. They are not required to be tested to the same Australian Standards for combustion emissions and temperature hazards as indoor gas appliances. 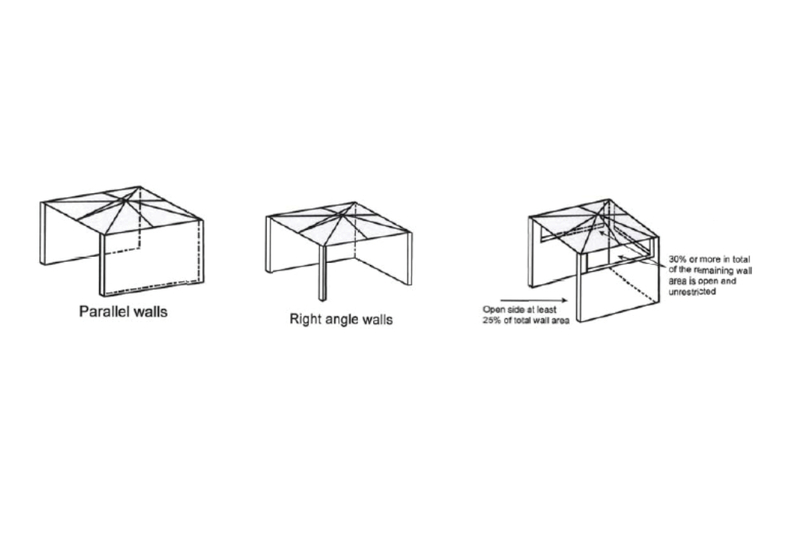 • Three walls, with one open side being at least 25percent of the total perimeter and the remaining three walls having an area of 30percent or more of unrestricted opening, with a roof or overhead cover. For these installations, the barbecue may be connected by flexible hose to a natural gas bayonet point or similar fittings, through fixed connections to gas piping or by connection to an LPG cylinder. If the area to be used does not meet the standards above, then it should be treated as an indoor area. This may also occur where the owner indicates that they intend to install plastic blinds or solid panels, creating “quasi-indoor” situation. In these cases the minimum opening of not less than 10% required to the perimeter, and if outdoor barbecues are to be used then a mechanical extraction system designed to handle barbecue exhausts should be mandatory. The extraction fan requires grease filters and a 1200mm clearance above the barbecue.